I have never met someone who did not like asparagus. Did you? I mean, there are so many fabulous ways to cook it – super crispy roasted asparagus, or white asparagus with hollandaise sauce, or a soup, or a tarte… nom nom! 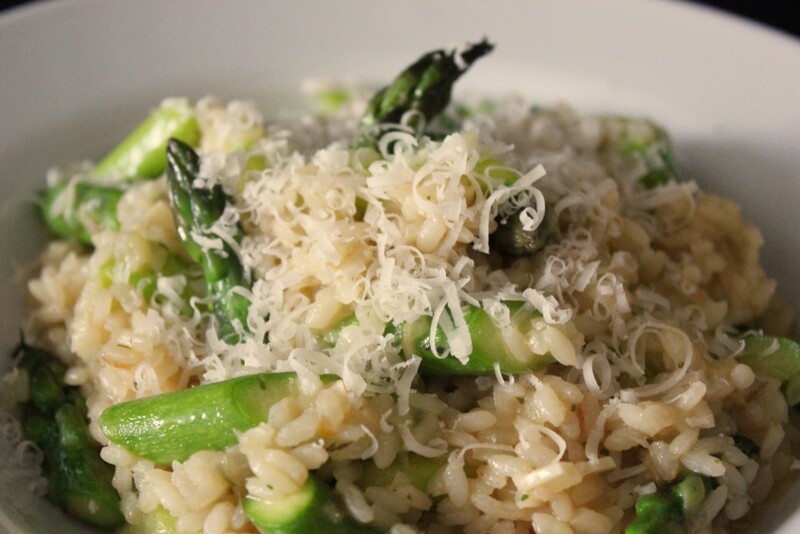 Cook the asparagus in salted water, for about two minutes, then drain it and cool it in ice water. Let it cool for a few minutes, drain and set aside. Heat the broth and keep it warm – you don’t want to add cool broth to your risotto, it would stop the cooking process again and again. In a medium-sized saucepan over medium-high heat, melt 1 tablespoon of butter and the olive oil. Add the onion and sauté until they just start to brown a little (about 4-5 minutes). Add the rice and stir frequently, for another 5 minutes. Add the wine and stir, let the rice absorb it. Once there is almost no liquid left, add about 100ml of the broth, stirring frequently. Turn the heat down to medium (my stove’s highest setting is 12, I usually go for a 7-8 here), it is not supposed to boil like crazy. 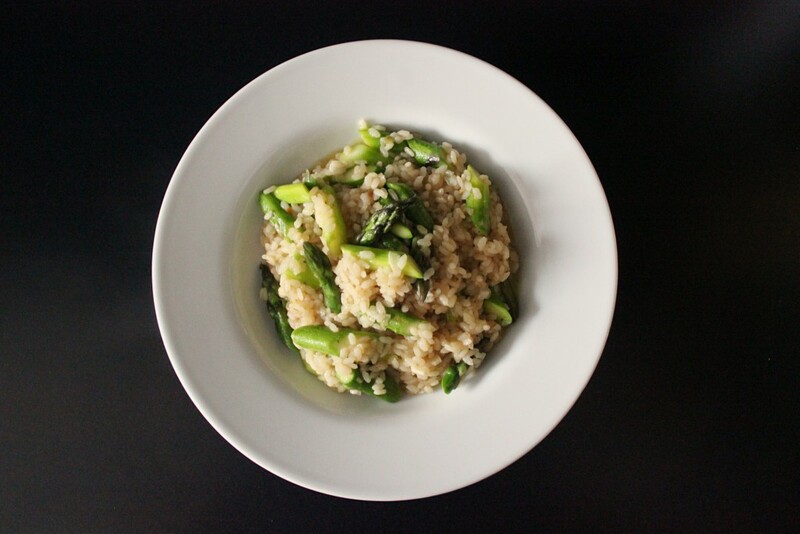 Once the rice has absorbed almost all of the broth, add another eyeballed 100ml of broth, let the rice absorb it, and repeat until the risotto has a creamy consistency and the rice is tender, but still slightly firm to the bite (“al dente”). This process takes about 20 minutes. Add the other tablespoon of butter and 1/4 of the Parmesan. Stir to combine, then add the asparagus and mix carefully. Serve with Parmesan – and enjoy! 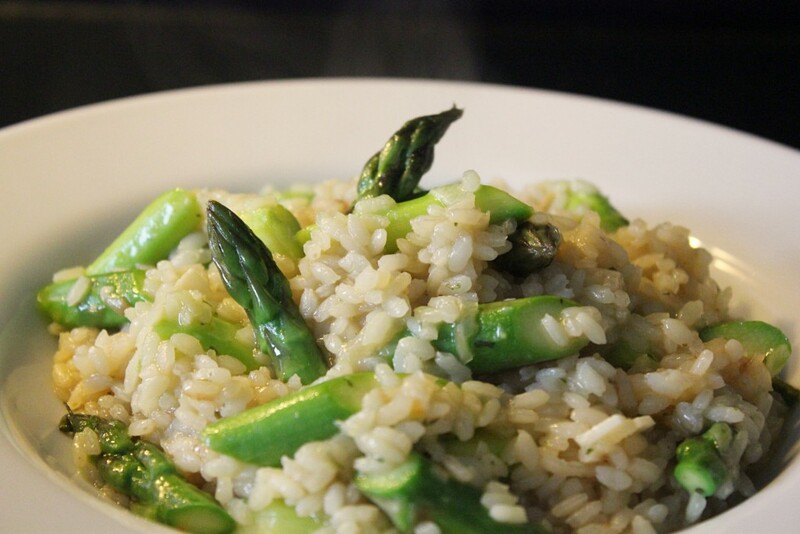 You can add the cut-off ends of the asparagus to the broth you use to cook the risotto instead of just throwing them away. Bring it to a boil, let it simmer for 15 minutes, then start making your risotto. 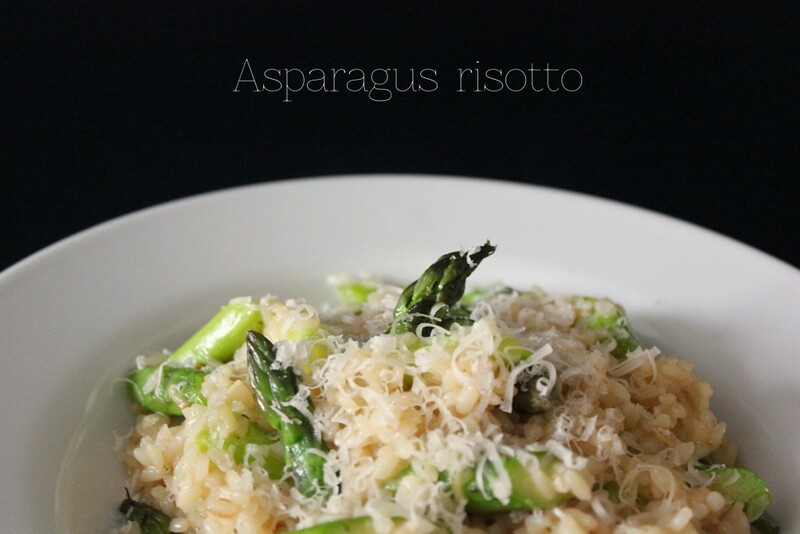 This is a great way to give this dish an extra intense asparagus flavor!